Ingredients for an Easy Hibachi Dinner Party are all prepped and laid out before cooking . An Easy Hibachi Dinner Party with EVO Grill is simple to accomplish with my step by step guide. I’d even say the results will be better than dining out at a traditional Japanese Steakhouse. It will certainly be a lot more affordable. For what you would spend on a family of 4 at a typical Japanese Steakhouse, you could invite ALL the neighbors over and feed them royally. 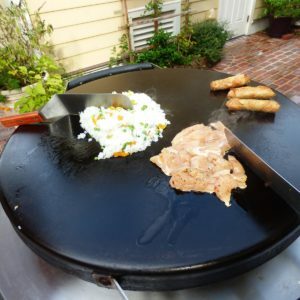 Of course, if you aren’t fortunate enough to have your own EVO, you can prepare this menu indoors on a griddle top or with multiple skillets. Not as easy, but still a lot fun and way less expensive than going out. I just love how the EVO’s circular shape gathers my friends around I’m cooking! 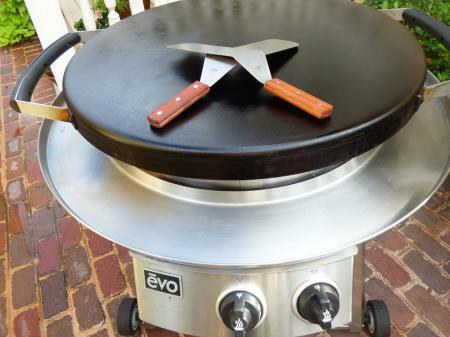 Evo Grill ready for Hibachi at Home meal. If you or your kids enjoy the traditional milder flavor found in the hibachi steakhouse, follow the instructions for mild version. Mix the soy sauce, broth, garlic, ginger, sesame oil, and lemon juice together in small bowl and set aside. You can use a broth paste reconstituted here or vegetarian broth if you not using meat in your meal. Add salt, pepper, and reserved minced garlic along with 1 T soy sauce mixture to chicken. 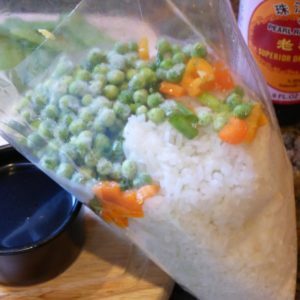 Prepare Rice by adding peas, scallions, chopped peppers and 1/4 of onion into bag of frozen rice ( You could also use small shrimp or other vegetables like carrots here). Add 1 T coconut oil to top of bag. It is very important that you have everything prepped before you begin cooking. This is usually the most time consuming part of preparing your meal. But having all this done does allow you to enjoy the “show” aspect of the cooking more easily. Like most people trying to get dinner on the table quickly, I have come up with several short cuts for making this meal at home that I’ll share as well. You can purchase pre-sliced vegetables from a salad bar or veggies prepackaged and prepped in places like Whole Foods. 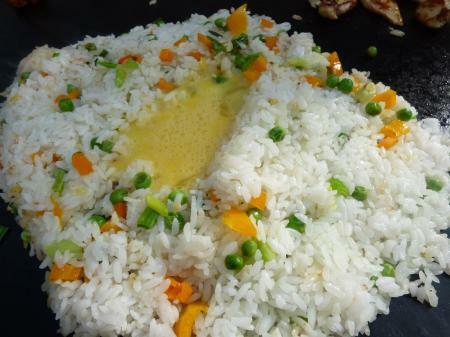 When making Fried Rice you need cooled cooked rice, so left over rice or frozen prepared rice (pictured) both work well. 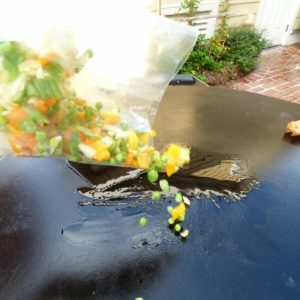 I usually throw some frozen vegetable dumplings or spring rolls right onto my grill surface as I’m cooking to use as an appetizer. It is also important that you preheat the grill (or pan ). 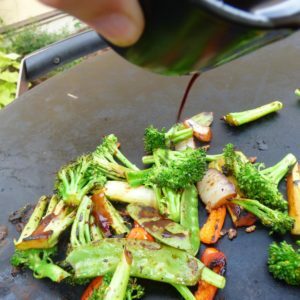 Then add 1 T oil and rice mix when it is hot in order to achieve that smoky flavor of a traditional Hibachi table meal without burning up your oil. I set my EVO to Medium high. Inside I would recommend high heat. 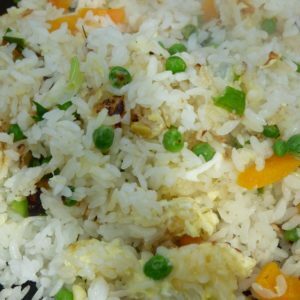 While rice is warming, you can begin preparing chicken and vegetables. 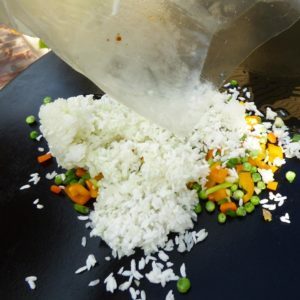 Frozen rice bag with all ingredients directly added is ready to cook. 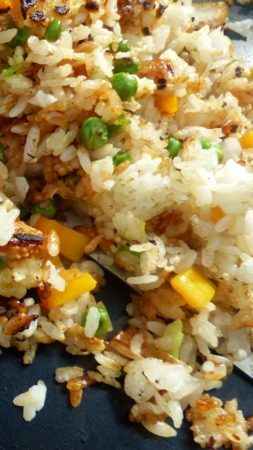 Fried Rice is super quick and easy when you use my shortcuts. Rice is added to hot cook surface. Begin Cooking chicken while rice browns. 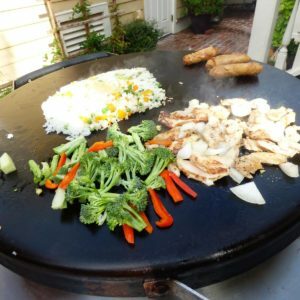 It’s possible to prepare an entire Hibachi meal at once on a EVO grill. Add 1 T grapeseed oil each to areas where chicken and chopped vegetables will go. 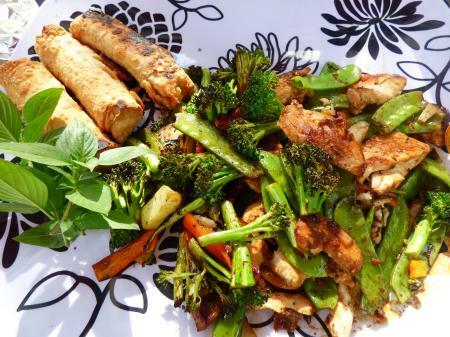 Add ingredients and begin stir frying. I sear the chicken about 3 minutes before turning. Stir vegetable s frequently. Once chicken is halfway done, make a well in center of rice and add your beaten egg. Let egg set up for a moment. Stir together with two spatulas to combine. Adding egg to fried rice. Add 1/3 soy mix to rice, incorporate into dish and remove rice from heat. Divide remaining soy mixture between the chicken and vegetables. Remove cooked chicken to warm plate. Cover vegetables if needed (will depend on type you use-broccoli in this mix benefits) to steam for 2 minutes. Remove to warm platter and combine with vegetables or leave separate. Garnish with herbs and serve with sriracha or chili oil on side for a spicy option. 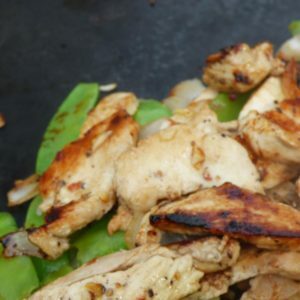 Hibachi style chicken made with free range chicken and low sodium soy. 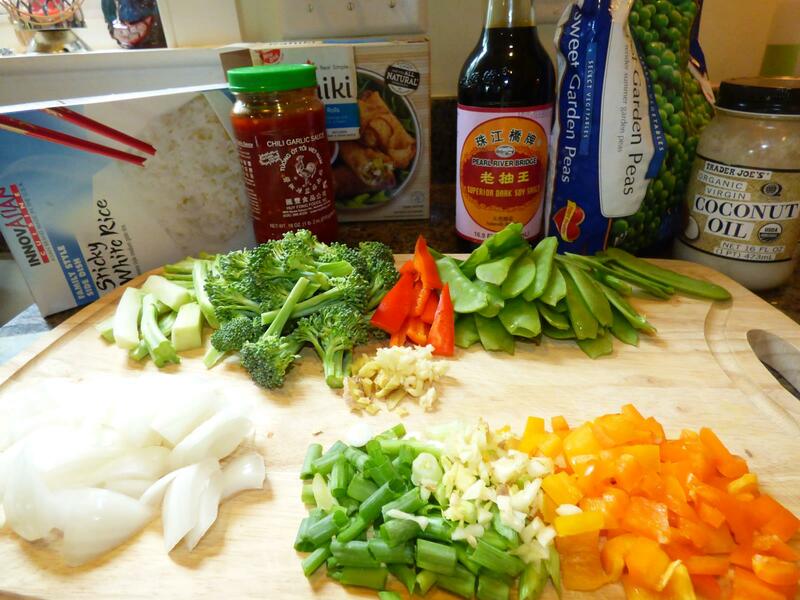 Soy mix is poured over vegetables,chicken, and fried rice. Fried rice close up before soy mix is added. So there it is. 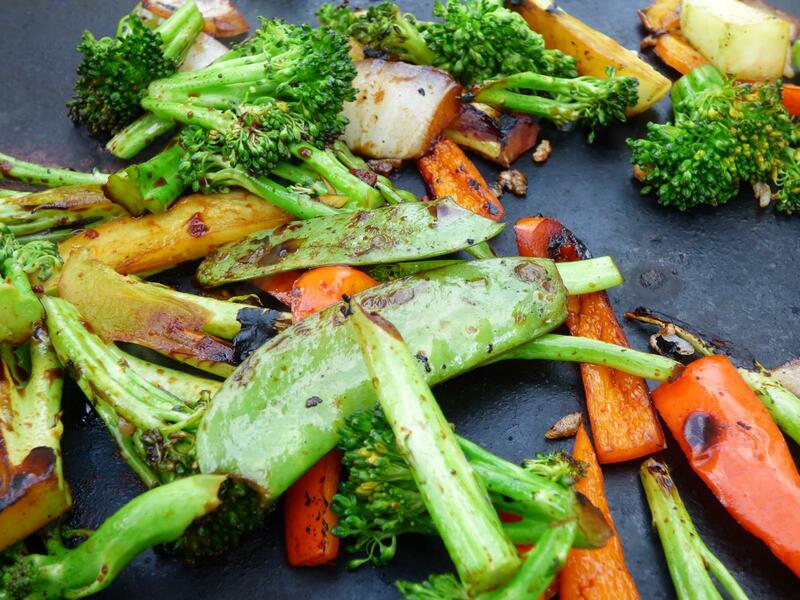 An Easy Hibachi Dinner Party with EVO- ready in just 15 minutes. That’s faster than take out friends! And a lot better for your family. You could easily double or triple the portions to feed a larger crowd. I also love to grill up a second vegetable dish of traditional sliced zucchini and bean sprouts. Or feel free to add-in a second meat or seafood. The basic method is the same whatever you choose to use. Hibachi Meal at Home is done in under 15 minutes! For an easy dessert idea, you can let guests grill some skewered pineapple sprinkled with brown sugar and a splash of rum right on the EVO and serve it with vanilla ice cream. I’ll post more Easy Hibachi at Home ideas and recipes soon. Until then, Let me know how your easy Hibachi Dinner Party went!